Would you prefer a light coloured ¾ cup nursing bra? How about the Radient In Her Rescue Nursing Bra from Hotmilk? If you are looking for a detailed and sumptuous breastfeeding bra, then we think you will love this bra. For example, it has a beautiful apricot floral print on the cup which looks really pretty. This is offset by delicate gardenia lace. What's more, it is finished with apricot satin trims and bows – it really is quite exquisite! How about the fabrics? Well if you prefer a soft and silky touch to your nursing bra then you should really like the comfortable microfibre which is very sensual. 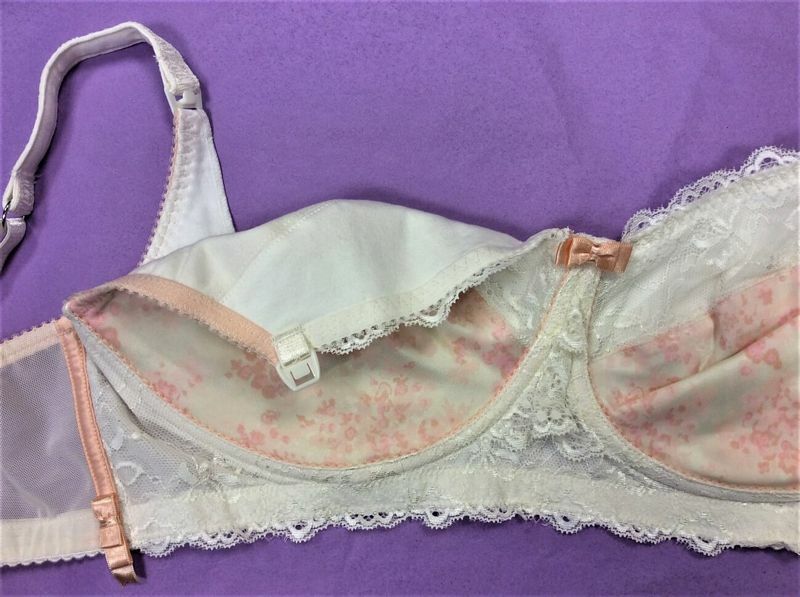 Breastfeeding advisers suggest that you should avoid having an underwire in your nursing months, so you will be pleased to know that this bra does not have an underwire – making it a safe choice. If you prefer a full set of nursing lingerie, then you can also add either matching bikini briefs or a g-string. Please see below for these options, or visit our “knickers and briefs” page – but please note, these must be bought separately! Not only does the bra look and feel beautiful, it also will give you great support too thanks to the slings at the side. If you have a few weeks or months to go until you give birth, then you will be pleased to know that not only is it a nursing bra, it is also a pre-natal bra, which means you can start wearing it right away! When it comes to feeding your baby, we think you will like how easy it is to open and close the cups with just one hand – so you can still hold you baby with one arm whilst opening the bra with your other hand. So, why should you choose the Radiant In Her Rescue breastfeeding bra? Well, if you prefer a light coloured nursing bra, we don't think there are many (if any!) that are as detailed and pretty as this. We think you will look and feel really feminine in this soft, silky bra. A lovely choice.